Twitter makes it easy to communicate with those already on the platform, but at times you’ll find that it’s necessary to share a tweet with someone who isn’t — such as your CEO. In November, the service added the ability to email tweets from its website. Unlike a retweet, which shares content with your followers, this features allows you to send a tweet to someone regardless of whether that person is on Twitter or not. While this isn’t a new functionality — you’ve been able to email tweets from Twitter’s mobile apps for some time — it’s just now rolling out on its website. It’s a fairly simple process, but we’ll walk you through the steps below. Find the tweet you want to share on Twitter.com. You’ll notice that if you hover over it, a “More” button now appears beside the Reply, Retweet, and Favorite options at the bottom of each tweet. After you’ve clicked on “More,” the “Email Tweet” option appears within a small drop-down menu will appear — suggesting that Twitter might add more to this in the future. It appears that the service is still rolling out this feature, so if you don’t see the “More” button yet, we recommend checking back in a few days. This is where the desktop email feature differs from mobile. When sharing tweets from your iPhone, for example, Twitter will pop up a new screen identical to the compose screen of Apple’s Mail app. On the desktop version of Twitter, a pop-up window will appear in the center of the screen, keeping you on Twitter the entire time. In this pop-up you’ll be asked to enter the email address of the person you want to send the tweet to. You’ll also have the option of including a personalized message, perhaps adding more context. For example, if you’re sharing some positive feedback from a customer, you can let your colleague know that the tweet referenced the most recent redesign. 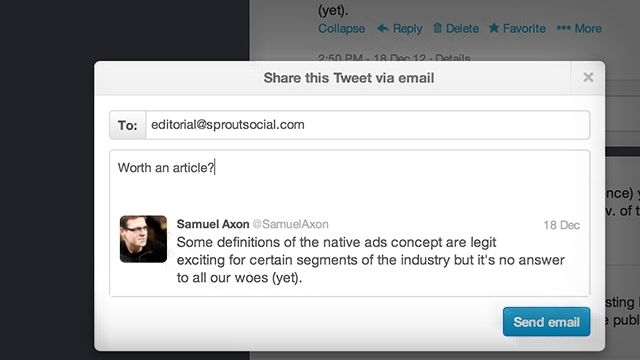 Receiving an emailed tweet is also easy for the recipient as this feature supports expanded tweets. If you sent a tweet that featured a web address, he or she can click the link within the email to go directly to the article — there’s no reason to visit Twitter. Despite this, every email contains a link near the bottom of the message encouraging the recipient to follow you on Twitter. At this time, it’s hard to know how many recipients have actually converted into followers. 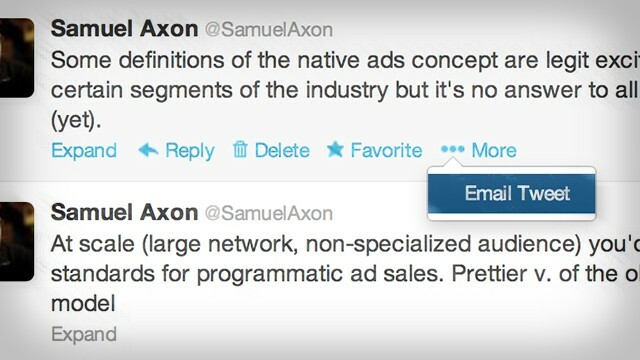 We should also note that Twitter is currently using a no-reply email to send the tweets. While it hides the email address associated with your account, it’s possible that many emails will wind up in spam folders rather than inboxes. 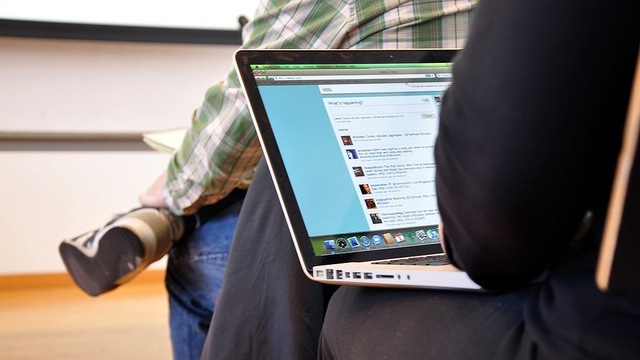 While it’s unlikely that you’ll email tweets very often, it’s a convenient option — especially for community managers or customer service reps.